The AGT will rely heavily on the honor system - individual honesty with scores and adhering to rules are a must for any golf league format to work! Every round MUST be played with at least one other member of the Tour. This is for accountability purposes, but also promotes the relationship and community-building aspect of AGT. When entering scores, you'll be asked who you played your round with. 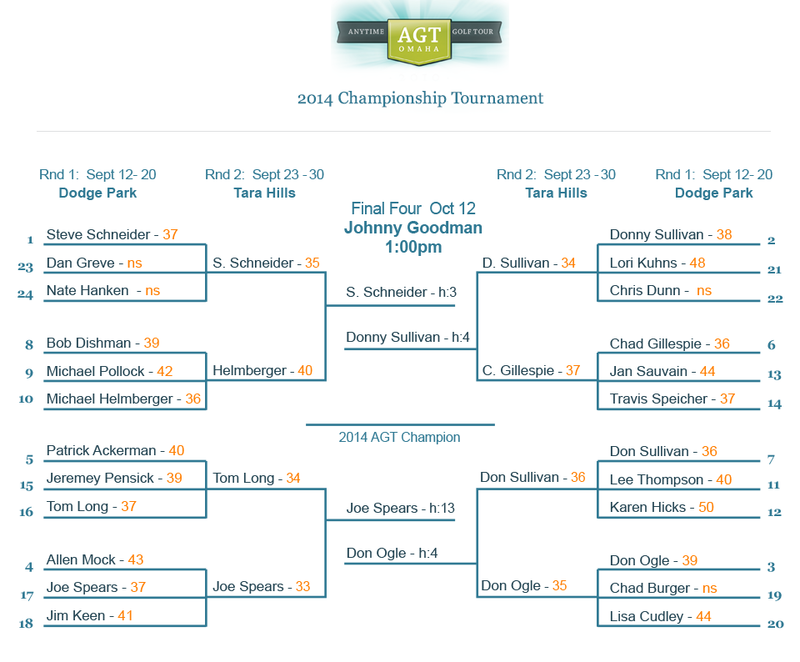 If you have trouble finding another AGT golfer for your outing(s), try contacting other members of the tour either through the site, or by email. If you're still having trouble, contact Dan, and we'll help get you hooked up with an outing. Once a course is "active" (during it's two-week window as shown on the schedule), your first score on that course is the score you must submit. In other words, no replaying the course multiple times during it's "active" period on the schedule. No redo's, or "try-agains" to attempt a better league score. You are of course free to play the course as many times as you like afterwards, but only the first score counts. If you want to practice a course before playing your official round, you must play it during it's inactive period. Each player is allowed two make-ups per season, which must be entered before the end of round 7. Scores entered late (past the end of a course's 2-week open period) will carry a 10-point penalty (league points). Make-ups are not permitted for round 8 or any of the tournament rounds. Male players tee-off from the second to furthest tee box if more than two are present. Otherwise from the furthest of the two. Female players tee-off from the women's tee, or the closest tee box to pin. Absolutely no Mulligans are allowed. If your ball is nicked off the tee, when aiming or aligning a shot, you may replace it without a stroke penalty. If however your ball is duffed, nicked, dribbled, sidewinded, or bamboozled, off the tee during an actual swing, that will count as a stroke. If the ball remains in the tee box (same one teeing off from) the player may re-tee the shot (with stroke penalty). If the ball leaves the tee box in-bounds, the shot must be played where it lies. A whiffed (not sniffed but whiffed) or totally missed shot counts as a stroke. If your ball is hit out of bounds, AND no "drop-area" is provided in close proximity, you must drop another ball in-bounds within 5 yards of the boundry where the original ball exited play (not where it came to lie) and add a penalty stroke (your shot plus one stroke). Use your best estimate. No re-teeing, if from a tee shot. If your ball was hit in-play/ in-bounds but you're not able to locate it, you may drop another ball in the general area where your ball was thought to be without any penalty - REMEMBER THE HONOR-SYSTEM! If, however, your ball was hit out of bounds or into a hazard (water, brush, very tall grass/weeds, alligator, etc. ), the drop rules apply with a stroke penalty. Ball Fluffing is, for example, when your ball lands in a patch of taller grass and you prop it up to sit on top of the grass to provide a more ideal striking position. This is allowed on any shot. This does NOT mean moving your ball to a different location. Absolutely no "gimmies" are allowed. Every ball must be holed unless the maximum strokes for that hole has been reached (see below). Each hole will carry a max score of 2x par. So the max score on a par 3 hole is 6 strokes, and so on.